← Tips. Easy ways to find Amazon books and authors. Privacy Wars. Big Brother on steroids: Is it a novel, or is it real? This was fiction …. until it happened…. As my book was in its final edits (June/July 2013), Edward Snowden, a low-level technical person with high-level security clearances, fled the United States and became the target of the biggest manhunt since Osama bin Laden. First he ran to Hong Kong, and finally, after a number of countries refused him sanctuary, he wound up stuck in the Moscow airport, unable to leave. It was like Tom Hanks in that old movie, except this one was real, deadly, and the focus of intense international attention. A few months after my novel came out, Snowden’s revelations of how America’s intelligence community had been shifted from watching foreign enemies to the massive monitoring of private citizens without due process or oversight became public. Concern increased when it was reported that Congress and reporters were also being watched. The result was high level outrage, and a determination to punish and silence Snowden. This caused conflict between Obama and Putin that made headlines and the top of news cycles. Putin won. He gave Snowden sanctuary. Snowden, NSA monitoring, CIA overreach, Obama Administration embarrassments, and the fallout and conflict that resulted was the top story in world news for months during the Fall and Winter of 2013. 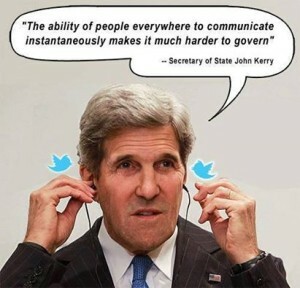 Despite intense efforts on the part of Team Obama to “change the subject” (Alinsky 101), this was the subject of Congressional Hearings (which continue to this day) and news reports. 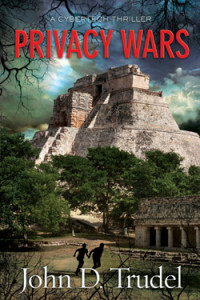 This topic came up in every media interview and book signing that I did for Privacy Wars. Indeed. It has since been pretty much admitted in testimony to Congress that everything electronic about American Citizens is being monitored and archived. But wait, there’s more: Shortly after the NSA scandal, egregious conduct on the part of the IRS came to light, with Lois Lerner famously being found to be in Contempt of Congress. It didn’t help matters when the IRS “lost” many records that were under subpoena. IRS targeting of “political enemies” was a second scandal, but the two come together. It is the IRS who will run ObamaCare, and part of ObamaCare is a massive, shared database with complete records on all who are enrolled. This database will have your health records, your tax records, your financial records, and everything else about you. The Gestapo and old KGB would be envious. This is Big Brother on steroids. These two scandals are still unfolding along with a number of others. Here are some links to public sources about these two. Investigations continue. The scandals continue. There has been a lot of talk, but not much action. My guess is that the issue of Big Brother watching Americans will continue to fester so long as Obama is in office. It is an area that scares the public, and one where both the left and the right have concerns. IRS is hated, NSA is feared, and my novel touched that. In summary, my novel’s prediction of these huge events got attention and I was asked to comment. What I can say is posted on my Author’s web page, www.johntrudel.com. There you will find clips of a number of interviews with radio hosts, magazines, and even political figures. Typically, the protocol for these interviews was to first have a conversation with the show’s producer or the official’s Chief of Staff. In all such cases I told them I would answer all questions to the best of my ability, BUT that all my answers would come from public sources, mostly from Congressional Testimony. When asked why, I said, “Because I don’t want to be living in the Moscow Airport like Snowden.” That usually got a chuckle. But it wasn’t funny, at least not to me. Back then, no one ever asked me that question on-air, but it always came up in the prep. Every time. In 2015 the topic of privacy got sizzling hot again, due to Congressional action (changing the Patriot Act), Executive action (ignoring the new law), Court rulings, a flood of major data breaches, foreign cyber attacks, the Hillary server debacle and release of Top Secret information, etc. A film about Snowden, Citizen Four, won an Academy Award. So Privacy Wars comes up again, usually without any prepping. If it does, I now invariably get that question asked on-air. My answer remains the same. The major concern these days has gone beyond Big Brother watching us. Big Brother is not only dangerous, but also incompetent. Intrusive bureaucracies want to watch us and put us all in silos (Brad Thor was right) which is bad enough. What is even worse, is that Big Brother’s databases are regularly being hacked by America’s enemies and criminals. Link. I hope you enjoy my book, and I hope that our freedoms and Constitutional Rights survive these events. Thank you for reading. It’s a difficult (perhaps impossible) thing to accomplish technically. Big Brother will not allow it. Departing Obama enforcer Eric Holder is pushing for legislation to block such phones before his resignation becomes effective. His replacement has the same position. This entry was posted in Actionable, Constitution & Gov, Enterprise, Non-Fiction, Novels and tagged Dark Side, Educational, Tyranny. Bookmark the permalink. 4 Responses to Privacy Wars. Big Brother on steroids: Is it a novel, or is it real? John, I shall buy your book. I’m old-fashioned, and will buy it at our Barnes and Noble Book Store, in the Portland, Oregon area. Thanks! Just ask, and they can order it for you. You can also get my novels in paper or electronically from Amazon. Shipping is free if you are Amazon Prime. Our primary home is in Oregon. We’re not there now, but I’m always happy to do book signings as schedules permit. The next one I have scheduled in Oregon is for the AFP group on May 13, 6:30 at the Clackamas County Public Training Center. I’m also doing one at #CAC16 (Author’s Conference) in Bellingham next week.